Check out the table below to read all about what kinds of tasks should be done in the garden through the year. Keep in mind that this information was written from the perspective of gardening in Michigan, USDA hardiness zone 5. You may need to make adjustments based on your particular climate. If one of your New Year’s resolutions includes creating or improving your garden in the new year, begin right now before that new inspiration is lost in the myriad of goals we all set this time of year. Don’t be put off by the icicles still hanging from the gutters and outdoor temperatures hovering near the freezing mark. There are many things you can do now to give those good intentions a jump-start and prepare for the season. By mid-January, seed and plant catalogs are arriving in the mail. Brightly colored gardening magazines are becoming plentiful and online sources offer all the encouragement needed to begin dreaming of spring. Begin by creating a special place on a shelf or within reach of your computer where you can keep all of your gardening books and materials. This will help to keep your ideas organized while you plan your dream garden. While snow is providing an insulating blanket for your sleeping plants, choose a sunny day to go for a walk in your garden and take some notes in your gardening journal. Does your garden hold any interest in the winter? Simply leaving a few perennials uncut in the fall can add interest and attract songbirds to your garden in the winter. 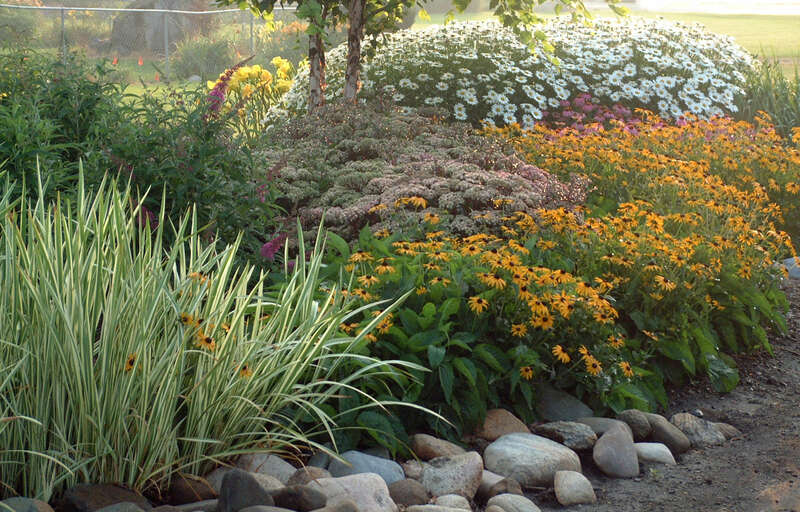 Perennials that provide winter interest and seeds for birds include: Astilbe, Bee Balm (Monarda), Echinacea (Purple Coneflower), Coreopsis (Tickseed), and Centaurea (Bachelor Button) as well as ornamental grasses. Birds will appreciate the important source of food and protection these plants offer if not deadheaded at the end of the season. Some of these winged creatures may reward you in the spring by staying around to feast on insects in your garden. Neighborhood birds will return often to a dependable birdfeeder in winter. Make sure your birdfeeder is full of sunflower seed, suet, and mixed seed. Natural Christmas tree boughs spread over your flower beds add protection and the falling evergreen needles help enrich the soil. The woody branches can be removed in the spring and the needles can be raked into the ground. A light dusting of snow will illuminate your garden paths this time of year. Step back and take pictures of your gardens to get a visual perspective of your garden’s structure in the winter. You will appreciate these pictures in summer and they will increase your awareness of the balance between your home and garden. Where do you want to add color this year? Ideas will emerge as you imagine how your garden will appear in spring. Although winter is far from over, Mother Nature often teases us with a few days of somewhat warmer, longer, and sunnier days in late winter. Alas, the garden is dormant, resting up for the work it must do when the season begins. When the groundhog reminds us there will be only 6 more weeks of winter, we know it’s time to get organized. Success hinges on good planning, and gardening is no exception. This winter, be sure to review the Design and Grow feature on this website to learn more about gardening successfully and develop a plan for the coming season. Work through Garden Design Elements to fully understand how to design a visually pleasing landscape. Develop a timeline, including what will need to be done first, second, and third. Look through your gardening catalogs again and take a second look at all the items you bookmarked in January. You can begin ordering now for spring shipping. In late February (timing will depend on individual varieties), start planting seeds in seed-starting flats of those perennials you’ll be growing from seed this year. By the time your frost-free date arrives in spring, you’ll be ready to plant! Clean and repair existing birdhouses or consider adding a birdhouse to your garden. Birds are excellent natural predators for slugs and other undesirable pests in the garden so the more you can attract, the better. Wrens and chickadees begin their mating calls and nest in late February and March. The sounds and appearance of colorful cardinals, blue jays, and others in your winter garden are sure to make someone smile. Do some research to find out what kinds of birds typically overwinter in your neighborhood and fill your birdfeeder with food specific to those kinds of birds. Feeders should be installed away from birdhouses. A birdbath or a shallow container of water is appreciated by these feathery creatures during the icy temperatures of February when clean water is not plentiful elsewhere. Occasionally crack the icy film that forms over the top. Check for displaced winter mulches and re-cover tender plants. Check perennials for frost-heaving. You could try gently pushing them back into the ground with your foot. If that doesn’t work, heap more snow on top of the garden to form an insulating blanket. 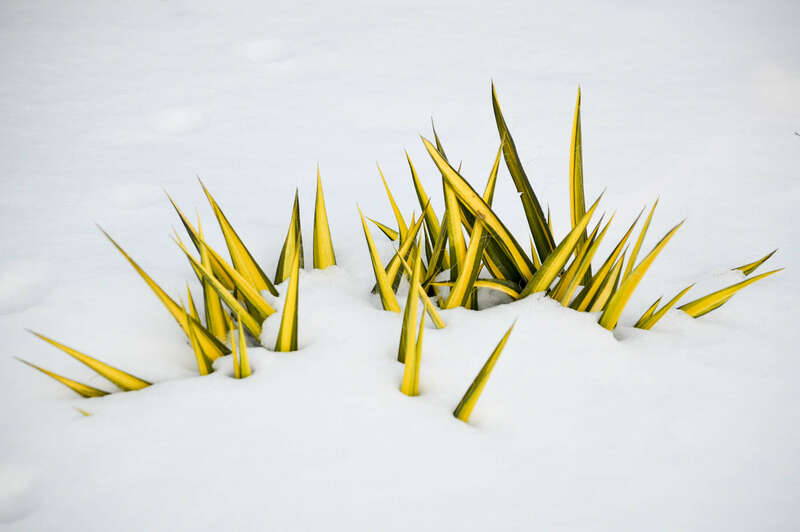 While you walk or drive around your neighborhood this winter, watch for interesting winter garden elements that catch your eye. Begin a list of ideas you could implement in your own garden. Keep a journal exclusively about your garden. Include temperatures, snowfall, pruning, fertilizing schedules, first plants that break ground, bloom times, etc. Look for a few swelling buds on the branches of Forsythia bushes and put them into a vase of water to force them into bloom and brighten your spirits. You may be surprised to see Hellebores and early tulips peeking through the snow in later February and March. Spring is coming--Hooray! Now is the time to start looking for containers that will be outstanding on the patio or porch this year. With the popularity of container gardening, garden centers now offer a broad range of containers including ceramic, terra cotta, metal, plastic, foam, and rice hull pots. Keep in mind that pots made out of porous materials such as terra cotta generally require more frequent watering in summer. Containers and window boxes that were used last year should be cleaned with a solution of one part chlorine bleach to nine parts water. Be sure to rinse them thoroughly and let them dry fully before stacking them back in the garage. While spring officially starts this month, the early part of March is usually still cold and wet in Michigan so we proceed with caution, wishing for a few days of encouraging warmer weather. Meanwhile, this is the time for deciding which new plants you’ll try this year and cleaning up the still-dormant garden. Check your timeline of things to be done before planting can begin. Remember you made this list in February when you were in planning mode. Finalize plans and dates for sprinkler start-up and repairs, installment of permanent hard scape items such as fences, pathways, patios, and ponds. Have the lawn mower serviced before repair shops begin to get too busy when the season begins. Look for ergonomic garden tools in catalogs and garden centers to replace broken or worn tools. They can ease your labor when garden chores get heavy. Inspect garden tools and sharpen or replace them if necessary. Be sure to have one or two pairs of garden gloves washed and ready to wear. They will be one of the first things you reach for when spring comes. If you need to test your soil and your soil is no longer frozen at this point, this is a good month to get that done. Testing will help determine which plants will grow best in your garden and aid in selecting fertilizers. Your local university extension office likely offers this soil testing service for a minimal fee. Some garden centers also offer soil testing. Call ahead and ask what they will need from you to test your soil. After pruning your trees and shrubs, save a few of the branches to use as supports for peonies, delphiniums, or other perennials that may need staking this summer. Set out birdhouses, away from birdfeeders and opposite wind currents. Many birds nest in trees but you can help them by putting out short strings, straw, dryer lint, fiber scraps, and the like. Robins use mud to line their nests. Continue to tend the plants you started from seed. They will be ready to transplant out into the garden soon. Remove the evergreen boughs you put on your garden beds after Christmas. You can begin to pull away winter mulches slowly, allowing sunlight to reach new plant growth but remaining close enough to continue to protect plants from cold winds. It is too soon to remove the mulch completely. Spring cleanup can begin the end of March and beginning of April, but try not to compact the soil by walking on it when it is wet from spring rains. Plants need the moisture and air in the soil to grow. 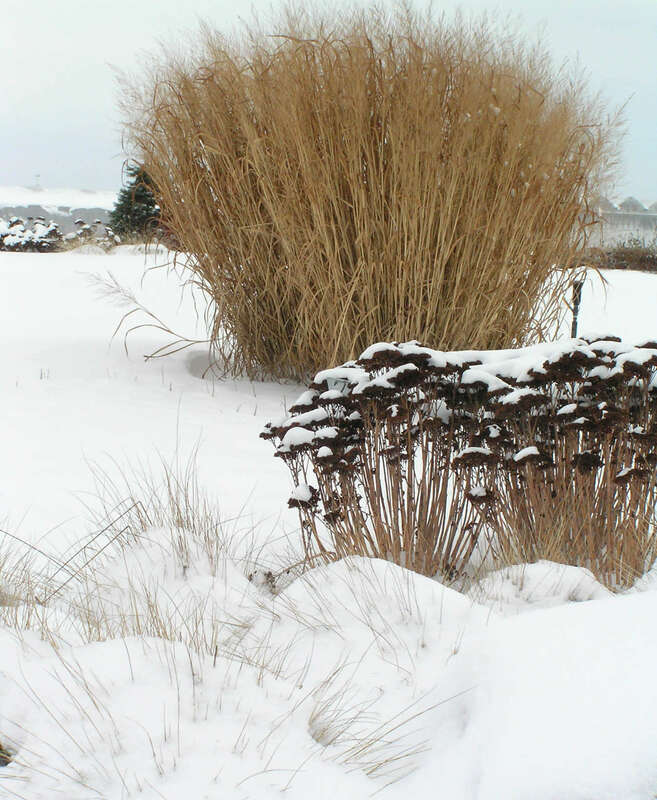 Cut back tall grasses and any other perennials that were left standing for winter interest. The sight of spring-flowering perennials and the arrival of warmer, sunnier days will undoubtedly put you in the mood to garden this month and there is much to be done. “April showers bring May flowers”, but April temperatures and rainfall can vary from year to year so you may need to alter the following recommendations accordingly. Gardening combines art with science. Consider how you will “paint the picture” in your garden this season. While long blooming perennials such as Geranium ‘Rozanne’ and ‘Going Bananas’ daylilies provide continuous color all season long, you may want to experiment with planting a sequence of flowering perennials that bloom at different times during the growing season and return year after year. Scroll through the Perennial Encyclopedia and make a wish list of your favorite perennials. Remember to bring this list to your garden center or landscape designer so you can find exactly what you’re looking for. It’s time to review Building Your Garden. The information you’ll find here will walk you through all the steps of building your garden, from deciding what you want to how to make it happen. Get ready for some action--Spring is here! Pressure-wash patio, walls, and paths to remove dirt and algae. Repaint fences and trellises when temperatures are above 40 degrees. Prepare your containers. Clean used pots with one part bleach to nine parts water and rinse thoroughly. Be sure the pots you plan to use have drainage holes in the sides or bottom. If not, drill them now. If you have not set out your birdhouses yet, do it now. Choose a sunny location facing away from wind currents. Do not cluster birdhouses together in the landscape; most birds are territorial creatures. If you haven’t done your spring cleanup yet and the weather allows it, do it now. Remove winter protection (evergreen boughs, mulch, etc.) gradually as growth appears, but be prepared to protect tender plants in case of a sudden April frost. Look for sprouting Convallaria (Lily of the Valley) pips, emerging shoots of hostas, and other emerging perennial plants. You should see them start to emerge soon if they haven’t already. If the ground is no longer frozen, you can begin to make soil amendments and fertilize perennials with a balanced 10-10-10 fertilizer. Never add more than the directions on the back of the package advise. Thin, divide, and transplant overcrowded perennials, herbs, and groundcovers. 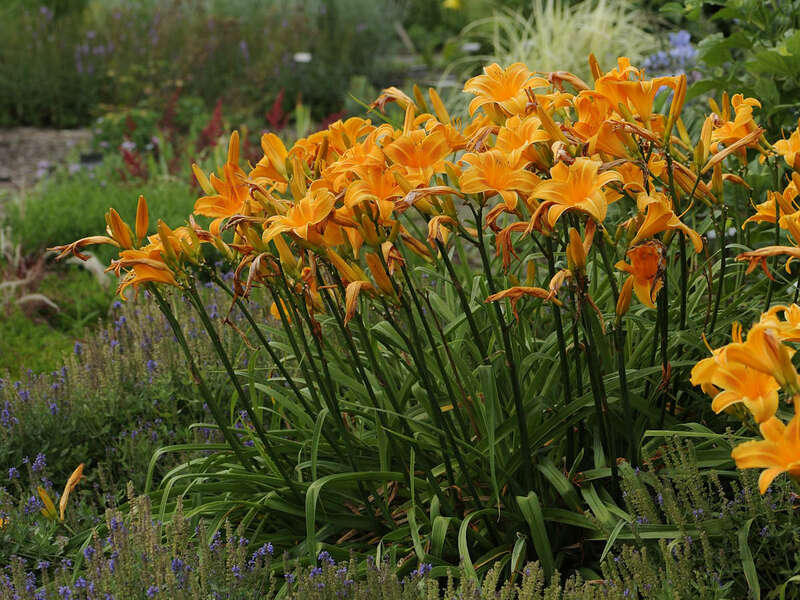 Daylilies, irises, hostas, ornamental grasses, and other perennials can be divided when they reach 2” to 3” in height. Pull weeds as soon as they begin to appear. Weeds are smaller and easier to pull during the rainy season. Be careful not to disturb perennials coming up in the garden. If you’re not sure if something is a weed, let it grow until you’re sure. Cut woody perennials such as Buddleia (Butterfly Bush) and Caryopteris (Blue Mist Shrub) back to 6” to 8” from the ground. Begin to harden-off pots of the things you grew from seed earlier this spring. Put them outside for a few hours every day in a shady but bright location and bring them in at night. Gradually introduce them to more sunlight. Do this for at least one week before planting them in the garden. Stay on top of the weather forecast for your area and be ready to protect plants from sudden frost using row cover material or mulch. Gardening mania begins in earnest as May bursts forth with loads of spring flowers. Primroses (Primula), Creeping Phlox, Columbine (Aquilegia), fragrant Lilies of the Valley (Convallaria), Forget-Me-Nots (Myosotis), and Bleeding Hearts (Dicentra) are a few of our favorites that return faithfully each spring. Mid-May is generally the time to begin planting things in the garden, but temperatures and precipitation can vary from year to year. Always be aware of the weather forecast in your vicinity and be prepared for a sudden frost. There is so much to be done now! Things are really coming to life in the garden, garden centers are bursting with colorful tempting displays, and migrating birds are returning to the neighborhood. Now is the time to bring the wish list you made earlier in the spring to the garden center to purchase your favorite new items. Having a list and a plan will keep you grounded when choosing plants suitable for your garden. Try to overcome the urge to buy one of everything at the garden center. Remember that a mass of one kind of plant will have more visual impact than just one of many different items. Refer back to the design principles if you get overwhelmed with all the choices. Get out all of the containers you plan to use this year and decide upon their placement. This will help you plan for which plants you’ll need to buy at the garden center this spring. Clean up and rake dead leaves and debris from the lawn and garden. Remove debris that may contain insect eggs or be carrying a disease. Be careful where you step! Some perennials are late to emerge in spring. Prune vines where appropriate and train them gently up their supports. Put out supports for peonies and other perennials that will need staking soon. When you pull the weeds in your garden, be sure to get the root too. Dampening the soil before pulling weeds makes it easier to get all of the root out. Remember, each weed pulled now may prevent many, many more weeds from developing later on. Divide and replant early blooming perennials after they are finished flowering. Planting fall-blooming perennials such as mums and asters now will allow them to establish a stronger root system, enabling them to return reliably year after year. Be sure not to overlook these plants in the garden center now. They tend to hide among the colorful spring blooming perennials in the garden center. Check your plants for slug and other insect damage now and treat them accordingly. This is a great time to plant perennials, biennials, groundcovers, vines, and herbs in the garden. Finally, you’ll be able to plant out any perennials you’ve grown from seed (if you haven’t done so already). For instructions on how to plant perennials, refer to Building Your Garden. Apply mulch after planting your new perennials. Be sure to keep it at least a couple of inches away from the base of the plants to avoid rot and insect problems. Summer begins in this long-awaited month of June. Hooray! Be sure to take time to relax and enjoy the beautiful details of your garden this month. Each day brings something new in the summer garden. By now, you are getting a sense of how colors, shapes, and textures work together as you paint your garden with a palette of personal plant choices. Notice the important role foliage plays in providing harmony between the plants. It will become even more important after the flowers have faded later this summer. This is the time to watch for insect damage and/or disease, especially Japanese Beetles. They are metallic green and bronze beetles that should be controlled before they lay their eggs in your lawn and the grubs develop. For other pest problems, your local garden center or extension office can help you identify problems and recommend remedies to keep your garden and the environment healthy. Be sure to identify the problem insect before choosing an insecticide. You wouldn’t want to kill the beneficial insects in your garden accidently. Enjoy the harvest of beautiful perennials from your garden that make good cut flowers. If you plan to dry any of them for later use, make preparations now. Continue to plant and transplant perennials. While the weather is still relatively cool, you can move plants around the garden to try new combinations or to see if they would grow better under different cultural conditions. For example, if you remember that your Brunnera tends to dry out and get overrun by the neighboring hosta every year, transplant it now or in the fall. Always water transplants in immediately after planting. Try adding another dimension to your garden with vertical growing vines that take the eye to another level. Some plants that add energy and lift to the garden are Clematis and Silver Lace Vine (Polygonum) for sunny locations or Climbing Hydrangea and Porcelain Vine (Ampelopsis) for partial to full shade. Deadheading faded flowers may prolong the bloom time of some perennials and keep the garden looking fresh. Keep an eye on the plants you are growing in containers. Fertilize them as necessary and remove unsightly foliage or spent blooms. Since plants in containers tend to dry out much more quickly than those planted in the ground, you will need to water them more frequently, especially as the temperatures heat up and rainfall decreases. Be sure to keep your garden watered well, especially as the temperatures start to heat up. Watering in the morning will help prevent plant diseases. Most plants require a minimum of one inch of rain per week. Mulch will help to conserve moisture around the plant and retard weed growth. Pinch back mums and asters to encourage fuller, more compact plants. As a general rule, you can pinch most perennials back until the fourth of July and still have them bloom that fall. 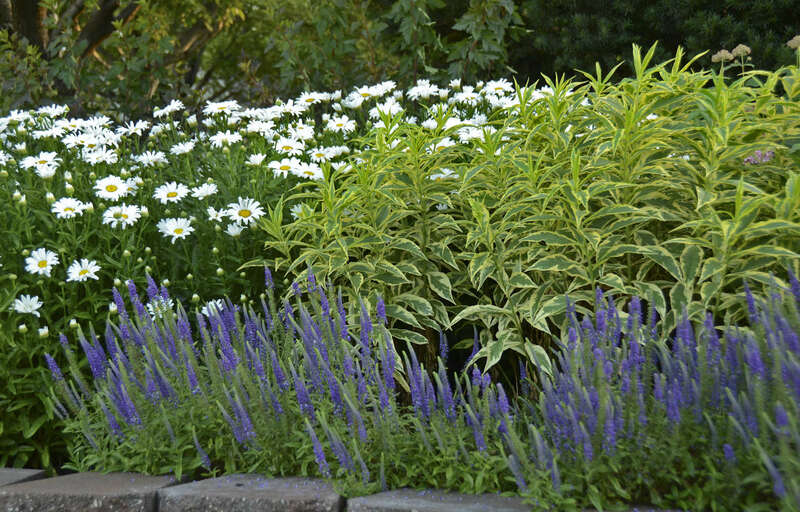 Cut back late spring blooming perennials such as yarrow and salvia to encourage a second flush of blooms in summer. If you have “holes” in the landscape, head back to the Perennial Encyclopedia to search for perennials that would grow well in those spaces. Use the detailed search function to search for plants with the specific criteria you are looking for (red flowers, evergreen, etc.). Gather a bouquet of flowers and give them to a neighbor or friend. Cutting perennials back often encourages them to rebloom and produce more flowers later in the season. Summer in the garden. What could be better than a place to unwind after a day at work, surrounded by the beauty of nature. Place a chair or two in a shady spot in the garden and pause to breathe deeply and enjoy the sounds, sights and fragrances…the fruits of your labor. Bare feet are recommended here. Take a deep breath and inhale the sweet fragrance of the flowers around you. In this relaxed setting, ask yourself a few questions about your garden and write your observations in your journal. Could your garden use a little more character or a few artistic elements? Summer art and craft fairs offer a rich bounty of unique items for the garden. Where could you add a bench or a decorative container of blossoms? Is there a perfect spot for a sundial or pretty birdbath, a simple water feature, or an antique gate on which vines could climb? Have a garden party and exchange plants with friends this month. In Michigan, July is the hottest month of the year and plants that are not heat and drought tolerant tend to make this fact quite obvious to you by their wilting foliage. Water often and thoroughly in the morning to encourage deep root growth and allow plant leaves to dry off during the day. If you’re not sure how much water to give your plants, dig down 2-3 inches into the soil after you’ve watered to see if the water is reaching the plants’ roots. One of the biggest mistakes gardeners make is watering too lightly too often. When this happens, the plants form most of their roots close to the soil surface instead of reaching down into the soil where consistent moisture is available, thus requiring more frequent watering. If the mulch is starting to wear thin in some areas of the garden, add more to retain ground moisture. If the mulch has started to crust over, loosen and fluff it up so water can permeate it and get down into the soil. Containers need constant watering, especially those in full sun. They may also need a good haircut by this time of year. Don’t be afraid to cut straggly plants back now; they will put out a fresh new flush of growth and blossoms in just a couple of weeks. The same is true for the perennials growing in the landscape. Pull weeds while they are small and before they set seed. Stop pinching back your mums and asters by July 4th to allow them to form buds by the fall. Begin to fertilize these plants by the end of the month. Continue to stake taller plants and train vines as needed. Deadhead spent flowers to keep the garden looking its best. Watch for insect or disease damage and take immediate action to control it. Be sure to identify the problem before choosing an appropriate insecticide. Your local university extension office can help you diagnose plant problems and advise treatment. 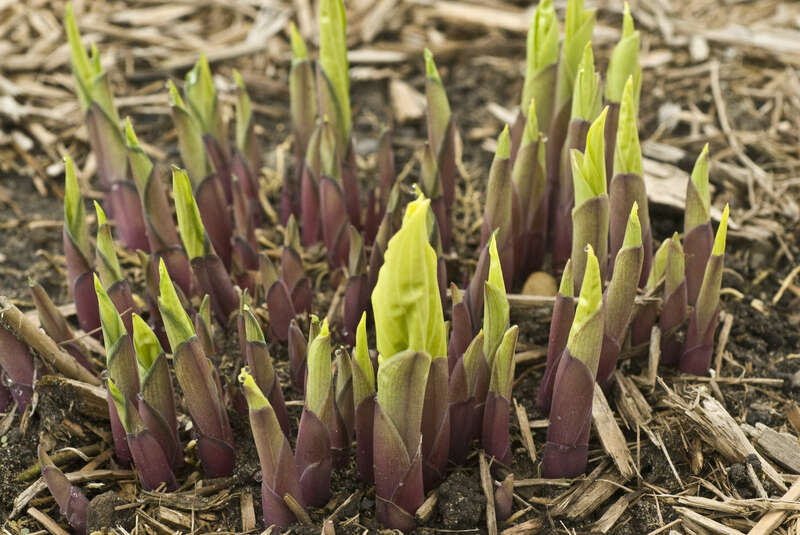 If you’re seeing signs of slug damage on your thinner-leafed hostas, you could try pinching off the lower leaves that lay on the ground to keep slugs from using them as ramps to climb into the plant. This gives the plant a nice upright look and can make them less appealing to slugs. If you have a serious slug problem, more drastic measures may need to be taken. Divide and replant Tall Bearded Iris rhizomes this time of year. These plants generally need dividing every 3 to 4 years. Dig up the entire clump and discard the old, woody rhizomes in the center of the clump. Separate the rhizomes growing around the edge of the clump into single fan sections. With a clean pair of scissors or clippers, cut the foliage back to about 5 inches tall. Replant these individual rhizomes in groups of 3 in a sunny, well-drained location. Be sure to leave the top of the rhizome exposed above the soil to avoid rot. Chances are, you’ll have plenty of extras to share with your fellow gardeners. Summer days can be hot and dry, so water will need to be a top priority for both you and your garden this month. Watering your plants thoroughly and deeply is much better than watering often but lightly. It is best to water in the morning so that the foliage has had time to dry off before nightfall. Mulching will help retain moisture in the soil. Stay cool and find some shade! August can be a real scorcher. By August, some of the early spring and summer perennials have bloomed and are fading. Do you have plenty of other perennials with late summer and fall interest that can take over for earlier bloomers this time of year? With a little planning, you can have color in every part of your garden all season long. By now, you know which plants have met your expectations and those that have not. Did some plants thrive while others failed? Did they receive the proper amount of sun or shade, water, and fertilizer? Be sure to note all of this in your journal and search the Perennial Encyclopedia for fall bloomers. If you’re unsure why something did not do well in your garden, look up the plant in the Perennial Encyclopedia and read the instructions on how to grow it to be sure you’re caring for it correctly. Take photos to help you remember your thoughts for future plantings. Cut back tired plants that have finished blooming for the year. Pull weeds before they go to seed. This will save you a lot of work later on. Fertilize your plants for the last time this year. Do not use a high nitrogen fertilizer, since you are not trying to promote new foliage growth at this time. Instead, use a fertilizer with a higher component of phosphorus or potassium. If you are unsure what kind of fertilizer to use, ask a knowledgeable employee at your local garden center or extension office. Deadheading spent blossoms often prolongs the bloom time of many perennials and keeps the garden looking its best. Remove any plants badly affected by insects or disease. Cut flowers for drying. Tie a bunch together and hang it upside down in a cool, dry place. 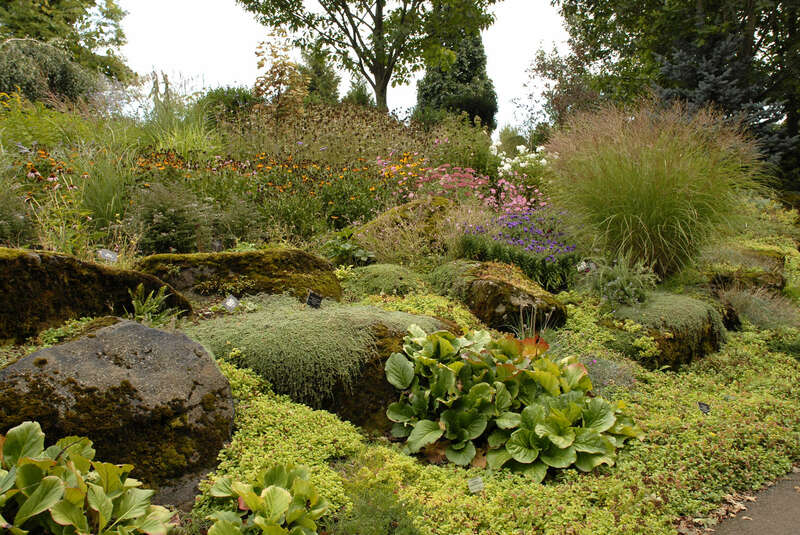 Most perennials can be transplanted and divided at this time if the temperatures have cooled down somewhat. If the weather is still hot, wait until next month. Fall planting is not recommended for ferns, ornamental grasses, or woody perennials such as Buddleia (Butterfly Bush). Always water transplants thoroughly after planting. The month of September is like a reward at the end of summer. The autumnal equinox arrives this month and the days are becoming noticeably shorter. In Michigan, the leaves are just starting to turn colors, berries are bountiful, and harvest-themed displays are starting to pop up all around us. Mums, Asters, and Heleniums in rich shades of red, orange, and gold abound at the local farmer’s market, pairing perfectly with the decorative gourds and bunches of wheat for sale. It is truly a rich time of year. The cooler days and evenings are a good time to sit in the garden and reflect on the valuable experience you have gained there. Write your thoughts in your gardening journal. This is the perfect time of year to extend the season by rejuvenating containers and the landscape with late blooming perennials. 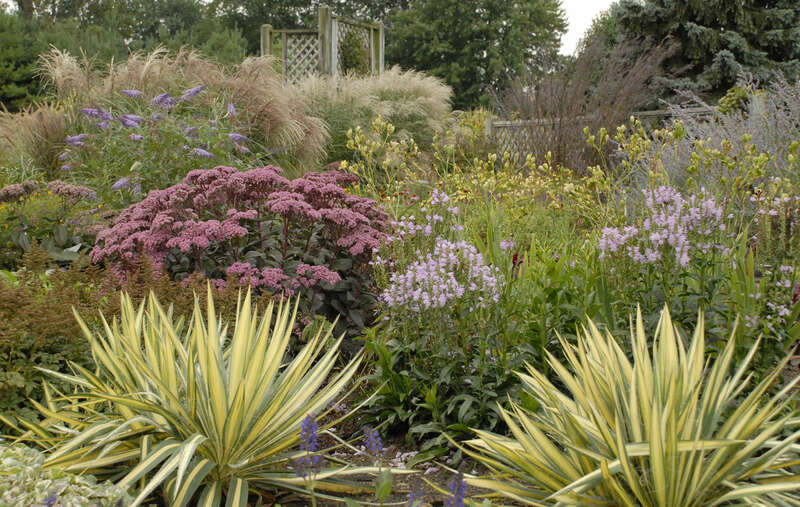 Search the Perennial Encyclopedia to find which fall blooming perennials are hardy in your zone. A few you might want to try are Black Eyed Susans (Rudbeckia), Asters, Helen’s Flower (Helenium), mums (Dendranthema), Sweet Autumn Clematis, and ornamental grasses. For fall foliage color, try October Daphne (Sedum sieboldii), Willow Blue Star (Amsonia), Mukdenia, or Blue Spruce Stonecrop (Sedum). It’s not too late to replace those tired, worn-out annuals with perennials that will continue to beautify your garden year after year. Many garden centers are having sales this month! Divide and transplant overcrowded or overgrown plants early in the month and keep them watered to allow roots to become established before the first frost. Clean out any diseased plants or foliage from the garden and discard. Continue to look for slugs, snails, and plant diseases. Address those problems now before frost arrives. Continue to pull perennial weeds before they go to seed to avoid pulling hundreds more next spring. Continue to water the plants in your garden even though their growth has slowed down. This is important because plants need enough moisture to get through the stress of the coming winter. Dig out any perennials you do not want to have in your garden next year. Make a note in your journal of any holes you’ll need to fill next spring. Take pictures of your fall garden. Make a note of places that need more color or interest this time of year so you can address those issues next spring. Stop deadheading any flowers or seed heads that you’ll want to leave for winter interest. The neighborhood birds will thank you. Have the leaves started falling in your yard already? It may be time to start raking already! October is a glorious time in Michigan. Tourists flock to the state mid-month to see forests filled with brilliant orange and red sugar maples, golden silver maples, and rich brown oaks. Enjoy the bounty of the season and let the warm feeling of the fall harvest fill your spirit. Though the chilly temperatures gradually separate us from our gardens, spring will come again before we know it. It’s time to make an appointment to have the sprinklers shut off this month before freezing temperatures come. Before they are shut off, make sure you’ve given everything in your garden several last long, deep waterings. After raking the leaves and once the plants are dormant, shred the leaves up and spread them on the garden. If you don’t have any leaves, straw will also do the job. These materials will decompose over the winter and enrich the soil with their organic content. Add a 2-4 inch layer of mulch on top of the shredded leaves to keep moisture in and insulate the plants’ roots from the coming frost. After the first hard frost, you’ll need to take care of any perennials that you plan to overwinter in their containers. Refer to The Complete Guide to Growing Perennials in Containers for specific instructions. Take in any garden ornaments or containers that may be damaged by the coming winter weather. Clean up and store all of your garden tools and gloves for the season. The days have become noticeably shorter now and your garden will soon go to sleep for the winter. 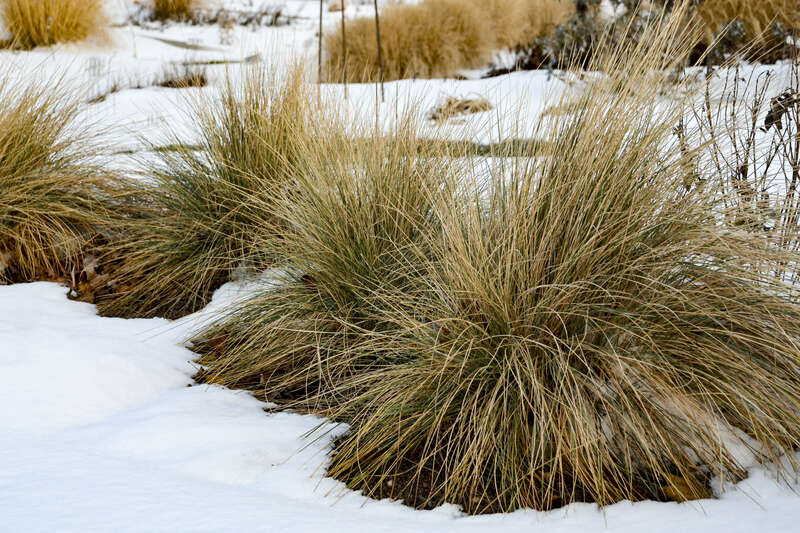 A few brave plants continue to shine through the cold weather, especially those with evergreen foliage or those you left standing for winter interest. Ornamental grasses steal the show as they offer you a standing ovation for all of your summer efforts. Take a look back through the journal and photographs you’ve been keeping all year long. This is a good time to reflect on all of the valuable experience you have gained working with nature to produce something beautiful for your home and garden. Some of the photographs you’ve taken might be worthy of framing to give to friends during the holidays. Be sure to pick up a new journal for next year while you’re out shopping this month. It’s time to clean up the gardening shed and get things ready to store for winter. Drain and store hoses before freezing temperatures arrive. Clean out any containers you’re finished with for the season and store them away for the winter. Be sure all of your tools are cleaned and stored away. Check to make sure the fall winds have not blown away the mulch you put down last month. Apply more if necessary. If any fall blooming perennials remain and you don’t plan to use them for winter interest, make sure you’ve cut them back before the snow comes. HOE, HOE, HOE is only a gardener’s spring dream this month. Your plants are taking a well-earned rest and so should you. This winter, give your sore back and knees a break so you’ll be able to start fresh next spring. Enjoy the festive winter holidays. Look out the window and enjoy your winter garden. As you sip a delicious cup of hot chocolate, reminisce about the beautiful flowers you grew last summer and dream about all the new things you’ll try next year. Add gardening books and subscriptions of your favorite gardening magazines to your wish list for Santa. These kinds of things make great gifts! Feed the neighborhood birds that have not flown south for the winter. A birdbath or other water source will be much appreciated once the temperatures dip below freezing and other available water sources have disappeared.